The blood–brain barrier (BBB) is a highly selective semipermeable border that separates the circulating blood from the brain and extracellular fluid in the central nervous system (CNS). The blood–brain barrier is formed by endothelial cells of the capillary wall, astrocyte end-feet ensheathing the capillary, and pericytes embedded in the capillary basement membrane. This system allows the passage of some molecules by passive diffusion, as well as the selective transport of molecules such as glucose, water and amino acids that are crucial to neural function. Specialized structures participating in sensory and secretory integration within neural circuits – the circumventricular organs and choroid plexus – do not have a blood–brain barrier. The blood–brain barrier restricts the passage of pathogens, the diffusion of solutes in the blood, and large or hydrophilic molecules into the cerebrospinal fluid (CSF), while allowing the diffusion of hydrophobic molecules (O2, CO2, hormones) and small polar molecules. Cells of the barrier actively transport metabolic products such as glucose across the barrier using specific transport proteins. The blood–brain barrier results from the selectivity of the tight junctions between endothelial cells in CNS vessels, which restricts the passage of solutes. At the interface between blood and the brain, endothelial cells are stitched together by these tight junctions, which are composed of smaller subunits, frequently biochemical dimers, that are transmembrane proteins such as occludin, claudins, junctional adhesion molecule (JAM), or ESAM, for example. Each of these transmembrane proteins is anchored into the endothelial cells by another protein complex that includes ZO-1 and associated proteins. Originally, experiments in the 1920s seemed to (wrongly) show that the blood–brain barrier (BBB) was still immature in newborns. This was due to an error in methodology (the osmotic pressure was too high and the delicate embryonal capillary vessels were partially damaged). It was later shown in experiments with a reduced volume of the injected liquids that the markers under investigation could not pass the BBB. It was reported that those natural substances such as albumin, α-1-fetoprotein or transferrin with elevated plasma concentration in the newborn could not be detected outside of cells in the brain. The transporter P-glycoprotein exists already in the embryonal endothelium. The measurement of brain uptake of acetamide, antipyrine, benzyl alcohol, butanol, caffeine, cytosine, phenytoin, ethanol, ethylene glycol, heroin, mannitol, methanol, phenobarbital, propylene glycol, thiourea, and urea in ether-anesthetized newborn vs. adult rabbits shows that newborn rabbit and adult rabbit brain endothelia are functionally similar with respect to lipid-mediated permeability. These data confirmed that no differences in permeability could be detected between newborn and adult BBB capillaries. No difference in brain uptake of glucose, amino acids, organic acids, purines, nucleosides, or choline was observed between adult and newborn rabbits. These experiments indicate that the newborn BBB has restrictive properties similar to that of the adult. In contrast to suggestions of an immature barrier in young animals, these studies indicate that a sophisticated, selective BBB is operative at birth. The blood–brain barrier acts effectively to protect the brain from circulating pathogens. Accordingly, blood-borne infections of the brain are rare. Infections of the brain that do occur are often difficult to treat. Antibodies are too large to cross the blood–brain barrier, and only certain antibiotics are able to pass. In some cases, a drug has to be administered directly into the cerebrospinal fluid (CSF) where it can enter the brain by crossing the blood–cerebrospinal fluid barrier. The blood–brain barrier may become leaky in select neurological diseases, such as amyotrophic lateral sclerosis, epilepsy, brain trauma and edema, and in systemic diseases, such as liver failure. The blood–brain barrier becomes more permeable during inflammation, allowing antibiotics and phagocytes to move across the BBB. However, this also allows bacteria and viruses to infiltrate the blood–brain barrier. Examples of pathogens that can traverse the blood–brain barrier include Toxoplasma gondii which causes toxoplasmosis, spirochetes like Borrelia (Lyme disease), Group B streptococci which causes meningitis in newborns, and Treponema pallidum which causes syphilis. Some of these harmful bacteria gain access by releasing cytotoxins like pneumolysin which have a direct toxic effect on brain microvascular endothelium and tight junctions. Circumventricular organs (CVOs) are individual structures located adjacent to the fourth ventricle or third ventricle in the brain, and are characterized by dense capillary beds with permeable endothelial cells unlike those of the blood–brain barrier. Included among CVOs having highly permeable capillaries are the area postrema, subfornical organ, vascular organ of the lamina terminalis, median eminence, pineal gland, and three lobes of the pituitary gland. 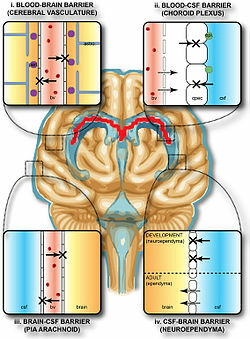 Permeable capillaries of the sensory CVOs (area postrema, subfornical organ, vascular organ of the lamina terminalis) enable rapid detection of circulating signals in systemic blood, while those of the secretory CVOs (median eminence, pineal gland, pituitary lobes) facilitate transport of brain-derived signals into the circulating blood. Consequently, the CVO permeable capillaries are the point of bidirectional blood–brain communication for neuroendocrine function. The border zones between brain tissue "behind" the blood–brain barrier and zones "open" to blood signals in certain CVOs contain specialized hybrid capillaries that are leakier than typical brain capillaries, but not as permeable as CVO capillaries. Such zones exist at the border of the area postrema–nucleus tractus solitarii (NTS), and median eminence–hypothalamic arcuate nucleus. These zones appear to function as rapid transit regions for brain structures involved in diverse neural circuits – like the NTS and arcuate nucleus – to rapidly control neurohumoral integration[clarification needed]. The permeable capillary zone shared between the median eminence and hypothalamic arcuate nucleus is augmented by wide pericapillary spaces, facilitating bidirectional flow of solutes between the two structures, and indicating that the median eminence is not only a secretory organ, but may also be a sensory CVO. Mechanisms for drug targeting in the brain involve going either "through" or "behind" the BBB. Modalities for drug delivery to the brain in unit doses through the BBB entail its disruption by osmotic means, or biochemically by the use of vasoactive substances such as bradykinin,  or even by localized exposure to high-intensity focused ultrasound (HIFU). Other methods used to get through the BBB may entail the use of endogenous transport systems, including carrier-mediated transporters such as glucose and amino acid carriers, receptor-mediated transcytosis for insulin or transferrin, and the blocking of active efflux transporters such as p-glycoprotein. However, vectors targeting BBB transporters, such as the transferrin receptor, have been found to remain entrapped in brain endothelial cells of capillaries, instead of being ferried across the BBB into the targeted area.Methods for drug delivery behind the BBB include intracerebral implantation (such as with needles) and convection-enhanced distribution. Mannitol can be used in bypassing the BBB. A significant amount of research in this area has been spent exploring methods of nanoparticle-mediated delivery of antineoplastic drugs to tumors in the central nervous system. For example, radiolabeled polyethylene glycol coated hexadecylcyanoacrylate nanospheres targeted and accumulated in a rat gliosarcoma. However, this method is not yet ready for clinical trials, due to the accumulation of the nanospheres in surrounding healthy tissue. Another, more promising approach, is the coating of polyalkylcyanoacrylate or poly-lactic-co-glycolic acid (PLGA) nanoparticles with polysorbate 80 or poloxamer 188. Due to this coating the particles adsorb apolipoproteins E or A-1 from the blood and thus interact with the signalling protein LRP1 or with the scavenger receptor followed by transcytosis across the blood–brain barrier into the brain. These particles loaded with doxorubicin for the treatment of glioblastomas are presently in Clinical Phase I. Recently, a novel class of multifunctional nanoparticles known as magneto-electric nanoparticles (MENs) has been discovered for externally controlled targeted delivery and release of drug(s) across BBB as well as wireless stimulation of cells deep in the brain. This approach depends more on the field control and less on the cellular microenvironment. In vitro and in vivo (on mice) experiments to prove the feasibility of using MENs to release a drug across BBB on demand and wirelessly stimulate the brain have been conducted by the research group of Prof. Sakhrat Khizroev at Florida International University (FIU). Vascular endothelial cells and associated pericytes are often abnormal in tumors and the blood–brain barrier may not always be intact in brain tumors. Also, the basement membrane is sometimes incomplete. Other factors, such as astrocytes, may contribute to the resistance of brain tumors to therapy. Peptides are able to cross the blood–brain barrier (BBB) through various mechanisms, opening new diagnostic and therapeutic avenues. However, their BBB transport data are scattered in the literature over different disciplines, using different methodologies reporting different influx or efflux aspects. Therefore, a comprehensive BBB peptide database (Brainpeps) was constructed to collect the BBB data available in the literature. Brainpeps currently contains BBB transport information with positive as well as negative results. The database is a useful tool to prioritize peptide choices for evaluating different BBB responses or studying quantitative structure-property (BBB behaviour) relationships of peptides. Because a multitude of methods have been used to assess the BBB behaviour of compounds, these methods and their responses are classified. Moreover, the relationships between the different BBB transport methods have been clarified and visualized. A brain or cerebral abscess, like other abscesses, is caused by inflammation and collection of lymphatic cells and infected material originating from a local or remote infection. A brain abscess is a rare, life-threatening condition. Local sources may include infections of the ear, the oral cavity and teeth, the paranasal sinuses, or an epidural abscess. Remote sources may include infections in the lung, heart or kidney. A brain abscess may also be caused by head trauma or as a complication of surgery. In children cerebral abscesses are usually linked to congenital heart disease. In most cases, 8–12 weeks of antibacterial therapy is required. Some evidence indicates that disruption of the blood–brain barrier in Alzheimer's disease patients allows blood plasma containing amyloid beta (Aβ) to enter the brain where the Aβ adheres preferentially to the surface of astrocytes. These findings have led to the hypotheses that (1) breakdown of the blood–brain barrier allows access of neuron-binding autoantibodies and soluble exogenous Aβ42 to brain neurons and (2) binding of these autoantibodies to neurons triggers and/or facilitates the internalization and accumulation of cell surface-bound Aβ42 in vulnerable neurons through their natural tendency to clear surface-bound autoantibodies via endocytosis. Eventually the astrocyte is overwhelmed, dies, ruptures, and disintegrates, leaving behind the insoluble Aβ42 plaque. Thus, in some patients, Alzheimer's disease may be caused (or more likely, aggravated) by a breakdown in the blood–brain barrier. Many neurodegenerative diseases including synucleinopathies such as Parkinson's, and tauopathies such as Alzheimer's are thought to result from seeded misfolding from pathological extracellular protein variants known as prions. This prion-like hypothesis is gaining support in numerous studies in vitro and involving in vivo intracerebral injection of brain lysates, extracted protein (tau, alpha-synuclein) and synthetically generated fibers in alpha-synucleinopathies. These proteins are also detectable in increasing amounts in the plasma of patients suffering from these conditions (particularly total alpha-synuclein in Parkinson's disease patients). The extent to which and the mechanisms by which these prion-like proteins can penetrate the blood–brain barrier is currently unknown. Inflammation in the body may lead to effects on the brain via the blood–brain barrier. During systemic inflammation, whether in the form of infection or sterile inflammation, the BBB may undergo changes which may be disruptive or non-disruptive. Such changes may be part of a productive host response to systemic inflammation, or may lead to deleterious consequences within the central nervous system. These BBB changes likely play a role in the generation of sickness behaviour during systemic infection. These changes may also induce or accelerate disease within the brain, for example in multiple sclerosis and Alzheimer's disease, and may be part of the reason why patients with these conditions can deteriorate during an infection. Also, in patients with neurological disease the BBB may be abnormally sensitive to the effects of systemic inflammation. Paul Ehrlich was a bacteriologist studying staining, a procedure that is used in many microscopy studies to make fine biological structures visible using chemical dyes. As Ehrlich injected some of these dyes (notably the aniline dyes that were then widely used), the dye stained all of the organs of some kinds of animals except for their brains. At that time, Ehrlich attributed this lack of staining to the brain simply not picking up as much of the dye. However, in a later experiment in 1913, Edwin Goldmann (one of Ehrlich's students) injected the dye directly into the cerebrospinal fluids of animal brains. He found then the brains did become dyed, but the rest of the body did not, demonstrating the existence of a compartmentalization between the two. At that time, it was thought that the blood vessels themselves were responsible for the barrier, since no obvious membrane could be found. The concept of the blood–brain barrier (then termed hematoencephalic barrier) was proposed by a Berlin physician, Lewandowsky, in 1900. ^ a b c d e f Daneman, R; Prat, A (2015). "The Blood–Brain Barrier". Cold Spring Harbor Perspectives in Biology. 7 (1): a020412. doi:10.1101/cshperspect.a020412. PMC 4292164. PMID 25561720. ^ Ballabh, Praveen; Braun, Alex; Nedergaard, Maiken (2004). "The blood–brain barrier: an overview: Structure, regulation, and clinical implications". Neurobiology of Disease. 16 (1): 1–13. doi:10.1016/j.nbd.2003.12.016. PMID 15207256. ^ Kaur, C; Ling, EA (September 2017). "The circumventricular organs". Histology and histopathology. 32 (9): 879–892. doi:10.14670/HH-11-881. PMID 28177105. ^ Johansen, A; Hansen, HD; Svarer, C; Szabolcs, L; Leth-Petersen, S; Kristensen, JL; Gillings, N; Knudsen, GM (2017). "The importance of small polar radiometabolites in molecular neuroimaging: A PET study with [11C]Cimbi-36 labeled in two positions". Journal of Cerebral Blood Flow and Metabolism. Epub (4): 659–668. doi:10.1177/0271678x17746179. PMC 5888860. PMID 29215308. ^ a b c Stamatovic, Svetlana M.; Keep, Richard F.; Andjelkovic, Anuska V. (2008). "Brain Endothelial Cell-Cell Junctions: How to 'Open' the Blood Brain Barrier". Current Neuropharmacology. 6 (3): 179–92. doi:10.2174/157015908785777210. PMC 2687937. PMID 19506719. ^ Leeuwen, Lisanne Martine van; Evans, Robert J.; Jim, Kin Ki; Verboom, Theo; Fang, Xiaoming; Bojarczuk, Aleksandra; Malicki, Jarema; Johnston, Simon Andrew; Sar, Astrid Marijke van der (2018-02-15). "A transgenic zebrafish model for the in vivo study of the blood and choroid plexus brain barriers using claudin 5". Biology Open. 7 (2): bio030494. doi:10.1242/bio.030494. ISSN 2046-6390. PMC 5861362. PMID 29437557. ^ Hamilton, R. D.; Foss, A. J.; Leach, L. (2007). "Establishment of a humanin vitromodel of the outer blood-retinal barrier". Journal of Anatomy. 211 (6): 707–16. doi:10.1111/j.1469-7580.2007.00812.x. PMC 2375847. PMID 17922819 – via Wiley Online Library. ^ Pritchard, Thomas C.; Alloway, Kevin Douglas (1999). Medical Neuroscience (Preview). Hayes Barton Press. pp. 76–7. ISBN 978-1-889325-29-3. OCLC 41086829. Retrieved 2009-02-08 – via Google Books. ^ Tsai, Catherine E.; Daood, Monica J.; Lane, Robert H.; Hansen, Thor W.R.; Gruetzmacher, Elisa M.; Watchko, Jon F. (2002). "P-Glycoprotein Expression in Mouse Brain Increases with Maturation". Neonatology. 81 (1): 58–64. doi:10.1159/000047185. PMID 11803178. ^ a b Braun, Leon D.; Cornford, Eain M.; Oldendorf, William H. (1980). "Newborn Rabbit Blood–Brain Barrier Is Selectively Permeable and Differs Substantially from the Adult". Journal of Neurochemistry. 34 (1): 147–52. doi:10.1111/j.1471-4159.1980.tb04633.x. PMID 7452231. ^ a b c d Raza, Muhammad W.; Shad, Amjad; Pedler, Steve J; Karamat, Karamat A. (2005). "Penetration and activity of antibiotics in brain abscess". Journal of the College of Physicians and Surgeons Pakistan. 15 (3): 165–7. PMID 15808097. ^ Pardridge, William M (2011). "Drug transport in brain via the cerebrospinal fluid". Fluids Barriers CNS. 8 (1): 7. doi:10.1186/2045-8118-8-7. PMC 3042981. PMID 21349155. ^ Chen, Y (2013). "Novel modified method for injection into the cerebrospinal fluid via the cerebellomedullary cistern in mice". Acta Neurobiologiae Experimentalis. 73 (2): 304–11. PMID 23823990. ^ Tortora, Gerard J.; Berdell R. Funke; Christine L. Case (2010). Microbiology: An Introduction. San Francisco: Benjamin Cummings. pp. 439, 611. ISBN 978-0-321-55007-1. ^ Nizet, V; KS, Kim; M, Stins; M, Jonas; EY, Chi; D, Nguyen; CE, Rubens (1997). "Invasion of brain microvascular endothelial cells by group B streptococci". Infection and Immunity. 65 (12): 5074–5081. PMC 175731. PMID 9393798. ^ Zysk, Gregor (2001). "Pneumolysin Is the Main Inducer of Cytotoxicity to Brain Microvascular Endothelial Cells Caused by Streptococcus Pneumoniae". Infection and Immunity. 69 (2): 845–852. doi:10.1128/IAI.69.2.845-852.2001. PMC 97961. PMID 11159977. ^ Van Sorge, Nina M (2012). "Defense at the border: the blood–brain barrier versus bacterial foreigners". Future Microbiol. 7 (3): 383–394. doi:10.2217/fmb.12.1. PMC 3589978. PMID 22393891. ^ a b Gross, P. M (1992). "Circumventricular organ capillaries". Progress in Brain Research. 91: 219–33. PMID 1410407. ^ a b Miyata, S (2015). "New aspects in fenestrated capillary and tissue dynamics in the sensory circumventricular organs of adult brains". Frontiers in Neuroscience. 9: 390. doi:10.3389/fnins.2015.00390. PMC 4621430. PMID 26578857. ^ a b c d Rodríguez Esteban M.; Blázquez Juan L.; Guerra Montserrat (2010). "The design of barriers in the hypothalamus allows the median eminence and the arcuate nucleus to enjoy private milieus: The former opens to the portal blood and the latter to the cerebrospinal fluid". Peptides. 31 (4): 757–76. doi:10.1016/j.peptides.2010.01.003. PMID 20093161. ^ a b Gross, PM; Wall, KM; Pang, JJ; Shaver, SW; Wainman, DS (1990). "Microvascular specializations promoting rapid interstitial solute dispersion in nucleus tractus solitarius". American Journal of Physiology. Regulatory, Integrative and Comparative Physiology. 259 (6 Pt 2): R1131–8. doi:10.1152/ajpregu.1990.259.6.R1131. PMID 2260724. ^ a b Shaver, SW; Pang, JJ; Wainman, DS; Wall, KM; Gross, PM (1992). "Morphology and function of capillary networks in subregions of the rat tuber cinereum". Cell and Tissue Research. 267 (3): 437–48. PMID 1571958. ^ Marcos-Contreras, O. A.; Martinez de Lizarrondo, S.; Bardou, I.; Orset, C.; Pruvost, M.; Anfray, A.; Frigout, Y.; Hommet, Y.; Lebouvier, L.; Montaner, J.; Vivien, D.; Gauberti, M. (2016). "Hyperfibrinolysis increases blood brain barrier permeability by a plasmin and bradykinin-dependent mechanism". Blood. 128 (20): 2423–2434. doi:10.1182/blood-2016-03-705384. PMID 27531677. ^ McDannold, Nathan; Vykhodtseva, Natalia; Hynynen, Kullervo (May 2008). "Blood–brain barrier disruption induced by focused ultrasound and circulating preformed microbubbles appears to be characterized by the mechanical index". Ultrasound in Medicine and Biology. Elsevier. 34 (5): 834–840. doi:10.1016/j.ultrasmedbio.2007.10.016. PMC 2442477. PMID 18207311. ^ Wiley, Devin (2013). "Transcytosis and brain uptake of transferrin-containing nanoparticles by tuning avidity to transferrin receptor". Proc Natl Acad Sci U S A. 110 (21): 8662–7. Bibcode:2013PNAS..110.8662W. doi:10.1073/pnas.1307152110. PMC 3666717. PMID 23650374. ^ Paris-Robidas S, Emond V, Tremblay C, Soulet D, Calon F (July 2011). "In vivo labeling of brain capillary endothelial cells after intravenous injection of monoclonal antibodies targeting the transferrin receptor". Molecular Pharmacology. 80 (1): 32–9. doi:10.1124/mol.111.071027. PMID 21454448. ^ Silva, GA (December 2008). "Nanotechnology approaches to crossing the blood–brain barrier and drug delivery to the CNS". BMC Neuroscience. 9: S4. doi:10.1186/1471-2202-9-S3-S4. PMC 2604882. PMID 19091001 – via BioMed Central. ^ Brigger, I.; Morizet, J; Aubert, G; Chacun, H; Terrier-Lacombe, MJ; Couvreur, P; Vassal, G (December 2002). "Poly(ethylene glycol)-coated hexadecylcyanoacrylate nanospheres display a combined effect for brain tumor targeting". Journal of Pharmacology and Experimental Therapeutics. 303 (3): 928–36. doi:10.1124/jpet.102.039669. PMID 12438511 – via ASPET. ^ Nair, Madhavan; Guduru, Rakesh; Liang, Ping; Hong, Jeongmin; Sagar, Vidya; Khizroev, Sakhrat (2013). "Externally controlled on-demand release of anti-HIV drug using magneto-electric nanoparticles as carriers". Nature Communications. 4: 1707. Bibcode:2013NatCo...4E1707N. doi:10.1038/ncomms2717. PMID 23591874. ^ Hashizume, Hiroya; Baluk, Peter; Morikawa, Shunichi; McLean, John W.; Thurston, Gavin; Roberge, Sylvie; Jain, Rakesh K.; McDonald, Donald M. (April 2000). "Openings between Defective Endothelial Cells Explain Tumor Vessel Leakiness". American Journal of Pathology. 156 (4): 1363–80. doi:10.1016/S0002-9440(10)65006-7. PMC 1876882. PMID 10751361. ^ "Transport at the Blood Brain Barrier (BBB)". The Davis Lab. The University of Arizona. Archived from the original on 2018-02-10. Retrieved 2015-01-05. ^ Beam, T. R.; Allen, J. C. (December 1977). "Blood, Brain, and Cerebrospinal Fluid Concentrations of Several Antibiotics in Rabbits with Intact and Inflamed Meninges". Antimicrobial Agents and Chemotherapy. 12 (6): 710–6. doi:10.1128/AAC.12.6.710. PMC 430009. PMID 931369. ^ Tortora, Gerard J.; Berdell R. Funke; Christine L. Case (2010). Microbiology: An Introduction. San Francisco: Benjamin Cummings. p. 615. ISBN 978-0-321-55007-1. ^ Nordqvist, Christian (2010-04-16). "What Is A Brain Abscess (Cerebral Abscess)?". MNT Knowledge Center. Medical News Today. Archived from the original on 2010-04-18. ^ Oby, Emily; Janigro, Damir (2006). "The Blood–Brain Barrier and Epilepsy". Epilepsia. 47 (11): 1761–1774. doi:10.1111/j.1528-1167.2006.00817.x. ISSN 0013-9580. PMID 17116015. ^ Marchi, Nicola; Angelov, Lilyana; Masaryk, Thomas; Fazio, Vincent; Granata, Tiziana; Hernandez, Nadia; Hallene, Kerri; Diglaw, Tammy; Franic, Linda; Najm, Imad; Janigro, Damir (2007). "Seizure-Promoting Effect of Blood?Brain Barrier Disruption". Epilepsia. 48 (4): 732–42. doi:10.1111/j.1528-1167.2007.00988.x. PMC 4135474. PMID 17319915. ^ Seiffert, E.; Dreier, JP; Ivens, S; Bechmann, I; Tomkins, O; Heinemann, U; Friedman, A (2004). "Lasting Blood-Brain Barrier Disruption Induces Epileptic Focus in the Rat Somatosensory Cortex". Journal of Neuroscience. 24 (36): 7829–36. doi:10.1523/JNEUROSCI.1751-04.2004. PMID 15356194. ^ Uva, L.; Librizzi, L.; Marchi, N.; Noe, F.; Bongiovanni, R.; Vezzani, A.; Janigro, D.; De Curtis, M. (2008). "Acute induction of epileptiform discharges by pilocarpine in the in vitro isolated guinea-pig brain requires enhancement of blood–brain barrier permeability". Neuroscience. 151 (1): 303–12. doi:10.1016/j.neuroscience.2007.10.037. PMC 2774816. PMID 18082973. ^ Van Vliet, E. A.; Da Costa Araujo, S.; Redeker, S.; Van Schaik, R.; Aronica, E.; Gorter, J. A. (2007). "Blood–brain barrier leakage may lead to progression of temporal lobe epilepsy". Brain. 130 (2): 521–534. doi:10.1093/brain/awl318. PMID 17124188. ^ Ivens, S.; Kaufer, D.; Flores, L. P; Bechmann, I.; Zumsteg, D.; Tomkins, O.; Seiffert, E.; Heinemann, U.; Friedman, A. (2007). "TGF-beta receptor-mediated albumin uptake into astrocytes is involved in neocortical epileptogenesis". Brain. 130 (Pt 2): 535–47. doi:10.1093/brain/awl317. PMID 17121744. ^ Awasthi, Sanjay; Hallene, Kerri L; Fazio, Vince; Singhal, Sharad S; Cucullo, Luca; Awasthi, Yogesh C; Dini, Gabriele; Janigro, Damir (2005). "RLIP76, a non-ABC transporter, and drug resistance in epilepsy". BMC Neuroscience. 6: 61. doi:10.1186/1471-2202-6-61. PMC 1249579. PMID 16188027. ^ Löscher, Wolfgang; Potschka, Heidrun (2005). "Drug resistance in brain diseases and the role of drug efflux transporters". Nature Reviews Neuroscience. 6 (8): 591–602. doi:10.1038/nrn1728. PMID 16025095. ^ Waubant, Emmanuelle (2006). "Biomarkers indicative of blood–brain barrier disruption in multiple sclerosis". Disease Markers. 22 (4): 235–44. doi:10.1155/2006/709869. PMC 3850823. PMID 17124345. ^ Schinkel AH (April 1999). "P-Glycoprotein, a gatekeeper in the blood–brain barrier". Advanced Drug Delivery Reviews. 36 (2–3): 179–194. doi:10.1016/S0169-409X(98)00085-4. PMID 10837715. ^ Schreibelt, G; Musters, RJ; Reijerkerk, A; De Groot, LR; Van Der Pol, SM; Hendrikx, EM; Döpp, ED; Dijkstra, CD; Drukarch, B; De Vries, HE (August 2006). "Lipoic acid affects cellular migration into the central nervous system and stabilizes blood–brain barrier integrity". J. Immunol. 177 (4): 2630–7. doi:10.4049/jimmunol.177.4.2630. PMID 16888025. ^ Lennon, V. A.; Kryzer, TJ; Pittock, SJ; Verkman, AS; Hinson, SR (August 2005). "IgG marker of optic-spinal multiple sclerosis binds to the aquaporin-4 water channel". J. Exp. Med. 202 (4): 473–7. doi:10.1084/jem.20050304. PMC 2212860. PMID 16087714. ^ Pascual, J.; Wang, D; Lecumberri, B; Yang, H; Mao, X; Yang, R; De Vivo, DC (May 2004). "GLUT1 deficiency and other glucose transporter diseases". European Journal of Endocrinology. 150 (5): 627–33. doi:10.1530/eje.0.1500627. PMID 15132717. ^ Klepper, Jörg; Voit, Thomas (June 2002). "Facilitated glucose transporter protein type 1 (GLUT1) deficiency syndrome: impaired glucose transport into brain—a review". European Journal of Pediatrics. 161 (6): 295–304. doi:10.1007/s00431-002-0939-3. PMID 12029447. ^ Nagele, Robert G. (2006). "Alzheimer's disease: new mechanisms for an old problem". UMDNJ Research. 7 (2). Archived from the original on 2011-09-17. Retrieved 2011-07-22. ^ Williams, Kenneth C.; Hickey, William F. (2002). "Central nervous system damage, monocytes and macrophages, and neurological disorders in AIDS". Annual Review of Neuroscience. 25: 537–62. doi:10.1146/annurev.neuro.25.112701.142822. PMID 12052920. ^ Ivey, Nathan S; MacLean, Andrew G; Lackner, Andrew A (2009). "Acquired immunodeficiency syndrome and the blood-brain barrier". Journal of Neurovirology. 15 (2): 111–22. doi:10.1080/13550280902769764. PMC 2744422. PMID 19306229. ^ Varatharaj, Aravinthan; Galea, Ian (2016). "The blood-brain barrier in systemic inflammation". Brain, Behavior, and Immunity. 60: 1–12. doi:10.1016/j.bbi.2016.03.010. PMID 26995317. ^ Ortiz, GG; Pacheco-Moisés, FP; Macías-Islas, MÁ; Flores-Alvarado, LJ; Mireles-Ramírez, MA; González-Renovato, ED; Hernández-Navarro, VE; Sánchez-López, AL; Alatorre-Jiménez, MA (November 2014). "Role of the blood-brain barrier in multiple sclerosis". Archives of Medical Research. 45 (8): 687–97. doi:10.1016/j.arcmed.2014.11.013. PMID 25431839. ^ Erickson, MA; Banks, WA (October 2013). "Blood-brain barrier dysfunction as a cause and consequence of Alzheimer's disease". Journal of Cerebral Blood Flow and Metabolism. 33 (10): 1500–13. doi:10.1038/jcbfm.2013.135. PMC 3790938. PMID 23921899. ^ a b Saunders, N. R; Dziegielewska, K. M; Møllgård, K; Habgood, M. D (2015). "Markers for blood-brain barrier integrity: How appropriate is Evans blue in the twenty-first century and what are the alternatives?". Frontiers in Neuroscience. 9: 385. doi:10.3389/fnins.2015.00385. PMC 4624851. PMID 26578854. ^ "History of Blood-Brain Barrier". Davis Lab. Archived from the original on 2018-01-11. Retrieved 5 January 2015. ^ "History of Blood-Brain Barrier". The Davis Lab. University of Arizona. Archived from the original on 2012-04-25. Retrieved 2014-03-01.